The Health Star Rating – what is it and what does it mean for you? Written by Catherine Saxelby on Monday, 18 August 2014. 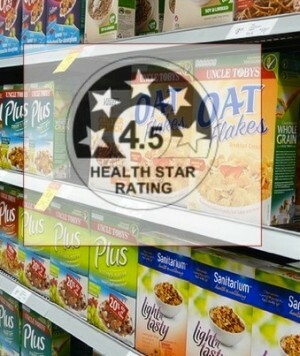 The Health Star Rating (HSR) system ranks food products on a scale from half to five stars on the front of food packs. Like the energy rating you spot on fridges and washing machines, the more stars the better. Foods with five stars being the best nutritional choice. It’s meant to help us decide whether or not to buy a packaged food product like a bar, cereal, bread or meal base, but how useful is it really? Like the familiar red Tick from the Heart Foundation, the new star rating is designed to give shoppers easy, at-a-glance information. Approved in June 2014 after a lengthy three-year debate, it will start to appear on the front of food packs over the next year or so. The rating is worked out from an algorithm that takes into account kilojoules or Calories plus three ‘bad’ or ‘negative’ nutrients - saturated fat, sugars, and sodium. These four aspects of a food - kilojoules, saturated fat, sodium and total sugars - are associated with an increase in the risk factors for chronic diseases like type 2 diabetes, heart disease, gallbladder disease and obesity which is why they’re the basis for the rating. This is balanced against the content of fruit, vegetable, nuts or legumes (fvnl). It can also show one single ‘positive’ nutrient such as protein or fibre. Here’s a mock-up of a full HSR graphic. All figures must be for 100g or 100 mL or per pack or per reference portion. The Monster Health Food Company has already released packaging with the HSR though the graphic doesn’t conform to the one above. As you can see the stars and their nutrient values are separate and colour co-ordinated with the pack colour. Impressively they maintain they haven’t had to change their recipes to achieve high ratings – from 3.5 to 5 stars. The system is to be implemented over the next five years, with a review of progress to take place two years after the commencement date i.e. in 2016. The Health Star Rating is a voluntary scheme so manufacturers can decide whether or not to use it on their packs. They have until January 2016 to change packaging. They can also use it with or without the Daily Intake Guide (%DI) which was their preferred labelling scheme. As far as I can see, the HSR tells shoppers more and is more meaningful than the %DI which just looks like a set of numbers and does anyone look at them? This is the same labelling logo you’ll spot if you shop at Sainsbury’s supermarket in the UK as I’ve done. Take a look at the three Traffic Light examples I snapped on their yoghurt, milk and biscuits in the photos. You quickly get used to looking at how many ‘reds’ are on a food label. Traffic Lights were preferred by health and consumer groups, but were rejected by the food industry. Probably because it’s easier to see at a glance than the %DI. Am I in favour of the Health Stars? At this early point, no. I do prefer the Health Stars over the simplistic Traffic Light system which had only the ONE set of criteria for ALL foods. You can’t compare an oil with 100 per cent fat with a loaf of bread with only 3 per cent fat – they each need their own set of criteria for any guide to be meaningful. Read my reasons why on Gemma O’Hanlon’s guest post on the Traffic Light Tracker App here. I much prefer the Tick where there are over 30 categories each with a separate criteria behind your product getting the red logo or not but the Tick doesn’t dazzle shoppers with all the calculations which are done behind the scenes. Read why I’m in favour of the Tick here. One drawback of the Tick is that manufacturers have to pay to be included in the system and small food companies can’t always afford the impost even though their foods may be healthy. The Stars rating tells shoppers more and is more meaningful than the %DI which just looks like a set of numbers. It’s gone through many rounds of revisions with later edits for dairy foods to allow them to be rated without penalty due their higher natural levels of saturated fat as you can see. Ditto for nuts. It can’t tell you everything about a food e.g. it doesn’t look at how many additives are present; it misses out on vitamins (vitamin B12 say) or minor minerals (selenium say); how processed and refined it is; or whether it’s local-grown or organic or free-from; or even whether it’s a whole food or not. You don’t get the whole story about a food’s value. So it’s only ONE tool to help you choose healthier packaged foods. It’s based on the government’s idea of what is healthy food AT THIS MOMENT. So saturated fat, salt and sugars take you down but in five years time maybe it will something else e.g. there is a lot of dissent about which type of saturated fat is really harmful i.e. is saturated fat from butter or cream ok? Hopefully HSR will be revised and updated as knowledge changes. Portion size is not taken into account as all foods are compared on an equal weight or volume basis. But we eat varying weights of food – compare a tablespoon or 20g jam in comparison with a 370ml can of soft drink. Both are compared on the same 100g or 100mL basis here. It’s voluntary so I doubt that manufacturers with low Ratings will bother to print them on their pack. Who wants to advertise that your food has only 1 or 2 Stars? Unlike electrical goods with their energy or water rating, this is a voluntary scheme. So consumers won’t get to see those foods high in sugar, salt and saturated fat that they should NOT be buying. I hope I’m wrong so I’ll wait and watch. Compare similar products within a category e.g. two breakfast cereals side by side. I’ve done the work using the Calculator (Excel) supplied by the website and here are a few comparisons. The Rating does rate junk, processed, unhealthy food poorly with less than 1 Star while rewarding whole, healthy, unprocessed items a high of 5 Stars – which is as it should be. I commend the Health Ministers for taking the initiative to develop this new Health Star Rating system but it’s a very complicated way of working out which foods can carry the stars. It doesn’t give you all you need to decide whether to buy a packaged food or not but it’s handy for in-category comparisons, assuming your favourite brand has decided to take part. I see only the large manufacturers with their teams of dietitians and food technologists being able to utilise the Health Star Rating, especially the method for calculating the percentage of concentrated and non-concentrated fruit or vegetables e.g. in smoothies, bars or cereals. It’s way too hard for smaller and boutique operators. I’ll reserve my final judgement until I see consumers using it over the next few months. Uncle Toby's are implementing the Health Star Rating across all their breakfast cereals at the end of 2014 and early 2015. Their website has been updated to include the Health Star Rating describing what it means, how to read it on pack, and give a Rating to each of their breakfast cereal. See HSR example in the image from their Plus Fibre cereal. Go to http://www.uncletobys.com.au/health-nutrition/health-star-rating/. The Health Star Rating website launched in December 2014 to help consumers and teachers get to know the new front-of-pack system at www.healthstarrating.gov.au. %DI Labelling - what does it mean? Do you understand LabelSpeak? Can you Crack the Code? Food labels can be frustrating, but only until you know the secret to decoding them. My eCourse Crack the Code will help you understand the key elements of a label; where to find them; how to check the claims on the front; “read around” the marketing hype; find where sugar or salt are hiding; spot hidden allergens and additives; and understand confusing ingredient lists, nutrition panels and date marking. You'll find out how to compare products side by side such as cereals, yoghurts, milks or muesli bars. Work through the six lessons all at once or at your own pace. Click here to learn more OR to enrol. Or go direct to my school at http://foodwatch-nutrition-updates.teachable.com.